I absolutely adore Toy Story and would consider the 3 feature length films as one of the greatest trilogies of all time. I was delighted when I discovered there was also some short films with our beloved toys in. They are all full of laughs, it's just non stop fun that puts a smile on your face. We see all the original characters as well as some new ones which I also liked (maybe they will be in Toy Story 4 if its ever made). It was nice that the original voice actors were all part of this too so it felt really original and not like some cheap rip off. The toys all look as good as ever, the surroundings are lovely and colourful as expected. I enjoyed all 3 of the short films I've seen so far but ''Hawaiian Vacation" is my favourite one. 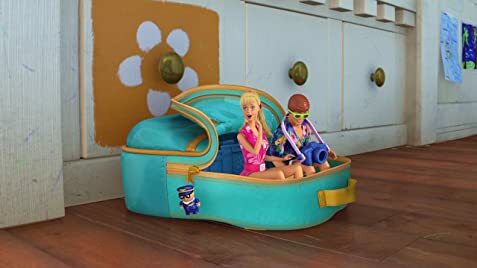 This one is for all the original characters and original setting and provided me with the most laughs as the toys make the bedroom look and feel like Hawaii. "Small Fry" was about Buzz who gets mixed up with a mini buzz and then goes to therapy, there's some really cool new characters in that one. "Partysaurus Rex" was about Rex hosting a party for all the bath toys, again new characters. That one was a bit crazy but still enjoyable. Overall they are 3 very different and very clever ideas executed to perfection, I really hope there is more of these made. They are excellent and make great viewing when you want a quick laugh. Highly recommend these, if you're a Toy Story fan you won't be disappointed. The swimsuit Barbie is wearing is the same model the first Barbie doll wore when she made her debut at the American International Toy Fair in New York on March 9, 1959. Buttercup: Hey, Potato Head. You in? Mrs. Potato Head: Sorry, boys. He's all mine. Mr. Potato Head: We're gonna spend the whole week together, just the two of us. Mr. Potato Head: Deal me in. In a post-credits scene, the other toys trying to free them from a block of ice in which they are now frozen.